we speak about cyanobacterial blooms. and prevention of cyanobacterial growth. Excessive blooms of cyanobacteria and excretion of their toxins into freshwater bodies in Europe and around the world represent one of the major health risks. The aim of the project is to present a solution for the early detection of cyanobacteria, prevention of their blooms and occurrence of cyanotoxins. The innovative technology is based on a scientific finding that the cyanobacterial viruses carry out the main control over the density of the cyanobacterial population. They are causing lysis or degradation of cyanobacterial cells. However, they need a certain trigger from the environment for their activation and proliferation in the cell. Such a trigger can be an electrochemical activation used in the project. The goal of the project is the demonstration and testing of the technology, by which we would significantly contribute to the improvement of the quality of standing freshwater bodies such as various reservoirs, bathing waters and surface water reservoirs for drinking water supply. During the three and a half year-long project we will demonstrate the performance of a high-tech solution on two natural freshwater bodies in Slovenia by conducting extensive monitoring of environmental parameters and efficiency of the system operation. The design of two floating working platforms (vessels) and service harbours. Collection of existing information on the status of the water bodies where the demonstration is going to be performed. Construction and testing of the vessels and service harbours in the natural environment. Establishment of the autonomous navigation of the vessels on the water bodies with simultaneous monitoring of the presence of cyanobacteria, green algae and other environmental parameters. Upgrade of the vessels with the system for the triggering cyanobacterial lysis and monitoring of the performance on the two water bodies. Monitoring of the environmental and socio-economic impacts of the project. Communication and dissemination of the results in Slovenia and internationally. 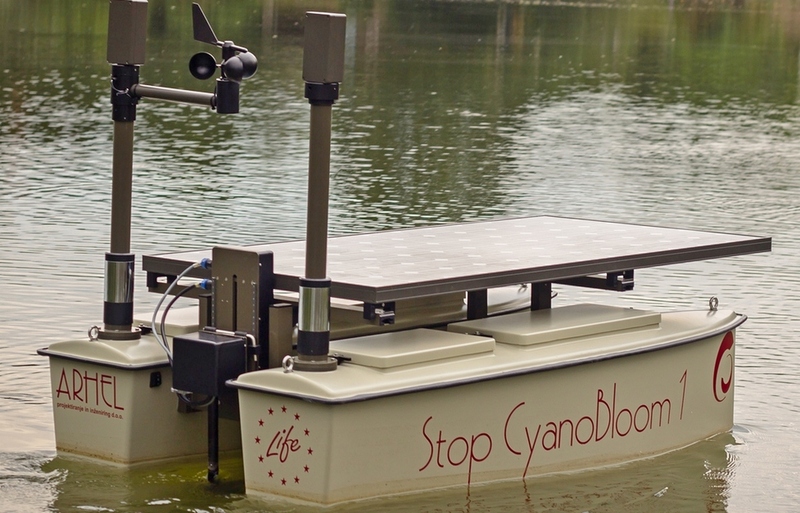 Absence of cyanobacteria blooms during the operation of the device with 50% lower concentration of toxic cyanobacteria during the period, which is usual for the development of cyanobacterial bloom. Absence of mycrocistins (toxins excreted by cyanobacteria) in the water body during the operation of the device. Improved status of selected water bodies: higher species diversity of phytoplankton with a higher proportion of green algae; positive impact on zooplankton, fishes, crustaceans, amphibians and birds; lower turbidity of the water column. Presentation of real-time data of monitored parameters on the web page. LIFE is the EU’s financial instrument supporting environmental and nature conservation projects throughout the EU. The programme covers three priority areas: environment and resource efficiency; nature and biodiversity; and environmental governance and information. The ‘Climate Action’ strand covers climate change mitigation; climate change adaptation; and climate governance and information.